I arrive outside the black wooden door of Dennis Severs’ House, knock gently on the door, and wait under the gas lantern which hangs outside. I had been told that visiting the red brick Georgian house at 18 Folgate was an experience like no other, that it was constructed in pieces over decades until it became a living, breathing piece of art in its own right, and that it had been described by the artist David Hockney as among the great opera experiences in the world (despite containing no opera in the traditional sense). I have to say, I was curious. 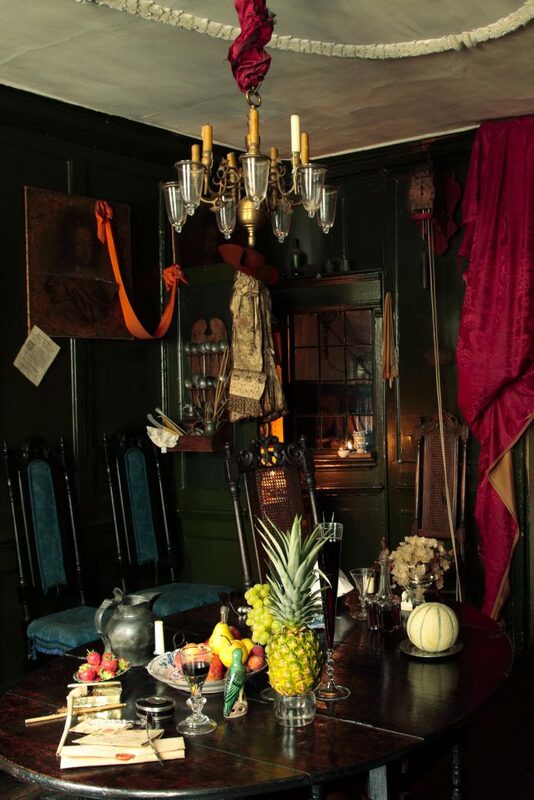 Dennis Severs’ House is in current form was conceived by Dennis Severs (as one might imagine) in 1979, an eccentric artist who slowly turned the rooms of his eighteenth century house into a series of what he called “still life dramas”. Imagine baroque paintings that you can step into, replete with the sounds and smells of a long-passed era, and you’re getting close. 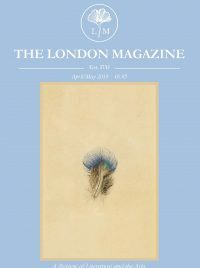 Stepping into the house is like entering into an interior frozen in time, an interior that manages to tell the story of the area of Spitalfields in East London — the historic identity of which is closely linked to the silk trade — through the story of a fictional family of Huguenot silk weavers from the 1700s. 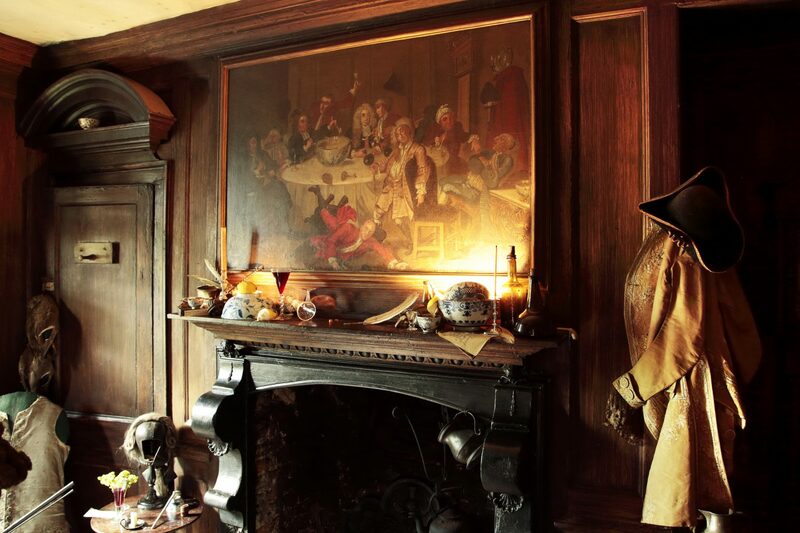 Since the passing of Dennis Severs in 1999, the house has been dutifully maintained by a dedicated team of staff who replenish fresh food, fires, flowers, candles and other ephemera on a daily basis to ensure the provision of a truly visceral and authentic encounter with history. There is a sense, as one moves through the rooms of the house, that the family have only just left. At times they can be heard, but they are never seen. The arrangement of the objects in each of the rooms serves to spark the imagination of the viewer, as reflected in the motto of the house, Aut Visum Aut Non (You Either See it or You Don’t). As the visitor moves from the cellar, up through the various rooms of the home, they traverse a narrative that plots the rise and fall of the locale, Spitalfields, from prosperous times, to a style of living perhaps best captured by Dickens’ London. Appearing central to the experiential nature of the still life, is the diffusion of scent throughout the building. The visitor is guided to the cellar to begin their tour of the space — the air hangs heavy with candle wax, accompanied by the sound of distant bells. The omission of barriers throughout the house enhances the authenticity of the experience. Climbing the stairs from the cellar kitchen to the ground floor, there is a sense of transition. The dining room is resplendent in its decoration when compared to the more stripped back family kitchen. Arrangements of personal effects around portraits reflect figures from the family. There is a sweeter scent in the air, that suggests a move towards a more affluent lifestyle, tracing the rising wealth of the silk weavers. On the table one finds cut bone china, and claret in cut crystal goblets. There is cutlery propped precariously on the edge of plates, as if left in haste by the invisible family. The walls are richer green, still lit by the warm candle light. Back through the hall, and up the stairs, to be greeted by the formal drawing room. The proportions of the space radiate from the hearth, demonstrating a sense of harmony central to late 18th century neo-classical ideals. The decoration of the room is distinctly opulent, with low slung velvet swags, gold, mirrors, and a marble fireplace, complete with mantle displaying porcelain figures. The ceiling is deeply coved, and decorated with floral cornicing. By the armchair in the corner of the room, there is a smashed teacup, knocked over as the family left the room. There are delectable piles of fruit and Turkish Delight. The eye becomes so enthralled, analysing each and every detail — as such, it is easily to become convinced as to the existence of the fictional family. The highly convincing nature of the displays is enhanced by the ruled silence throughout. Such silence is fundamental to a true experience of the space, allowing each guest to become completely enthralled by the constructed history of the house. 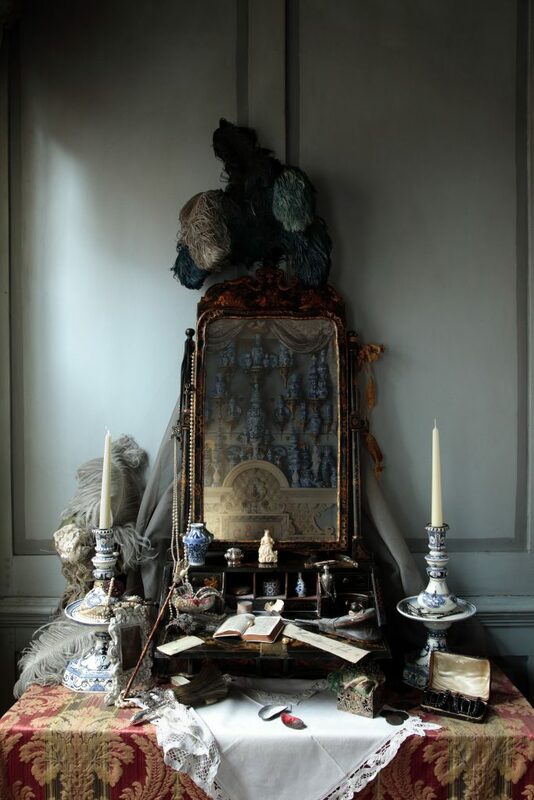 Dennis Severs himself utilised the imagery of period dramas and novels to bring together the displays, and as a result, there is a certain drama to the space, a fragility. The presentation of this invisible and imaginary family has become so convincing, that, at times, one feels like an intruder. The vow of silence taken upon entering the house becomes necessary, in case one is caught out. The visitor is left to interpret the placement of the objects in their own way, however there are a number of prompts distributed throughout the rooms which encourage a second look. In another of the rooms, a Hogarth painting hangs on the wall, depicting a series of men around a punch bowl, falling off their chairs in inebriation. When your eyes leave the painting, you realise that you are stood in its aftermath — empty punch bowl, chairs, tobacco and smashed wine glasses all over the floor, and the musty, pan-century odor of the hangover of a party. It is a direct manifestation of the living “still life” concept which drives the mode of display in the house, carrying forward the aforementioned sense of theatricality which underlies the spirit of the house. The current curator, David Milne, has worked to maintain the creative vision of Severs, while ensuring that the arrangements remain fresh, both conceptually, and literally. The bedchamber on the second floor serves as a space of exhibition for an eclectic mix of objects. Countless trinkets draw the eye — the air infused with a homely spiced scent; ginger and rosemary. The richly decorated four-poster bed dominates the space, exuding a sense of elegance that is interrupted by the dishevelled bedsheets, swiftly pushed aside. On the dressing table sit a pair of earrings, the same as those which can be seen in the drawing room, bringing each space into conversation, linking them through an invisible character. Moving up to the third floor, the circumstance of the dwelling begins to break down. The staircase is teeming with cobwebs — laundry hangs low, the floor rickety. The bedrooms of this floor are a stark contrast to the rich velvets and gilded mirrors of the lower floors — the year is 1837, and the house is filled with lodgers; whole families to one room. There are still traces of opulence long gone, but the fabrics are now worn, the walls greyed. Dennis Severs’ house provides a fascinating insight into the life of a family, however fictional, that reflects the changes in the local area and the development of modern London. Spitalfields has changed to a great degree since its conception as a medieval hospital outside of the City walls. It is an area in constant flux, a small liberty which after the dissolution of the monasteries in the 16th century had its own by-laws and council of aldermen. This led the area to become, for generations, a natural place for not just the Huguenots, but also Russians, Irish, Jewish and Bengali immigrants to settle, along with a host of political dissidents. Despite the constant re-generation of London — the quite literal building upon history that you can experience around the corner by descending into a medieval charnel house — it is an area that retains its essence. 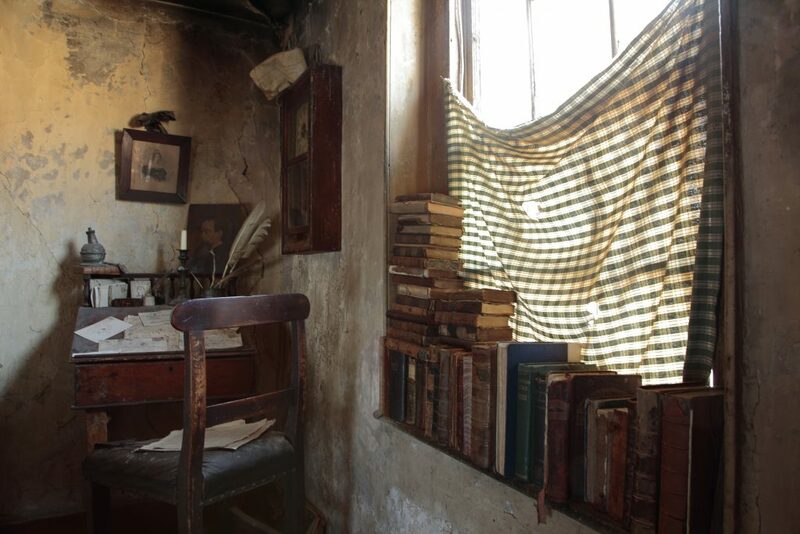 Dennis Severs’ House however, does not appear as a museum; instead, it is an intensely localised and personal exploration of city life itself, bridging the gap between fact and fiction, constantly reminding the visitor of the multiplicity of urban living through the ages. 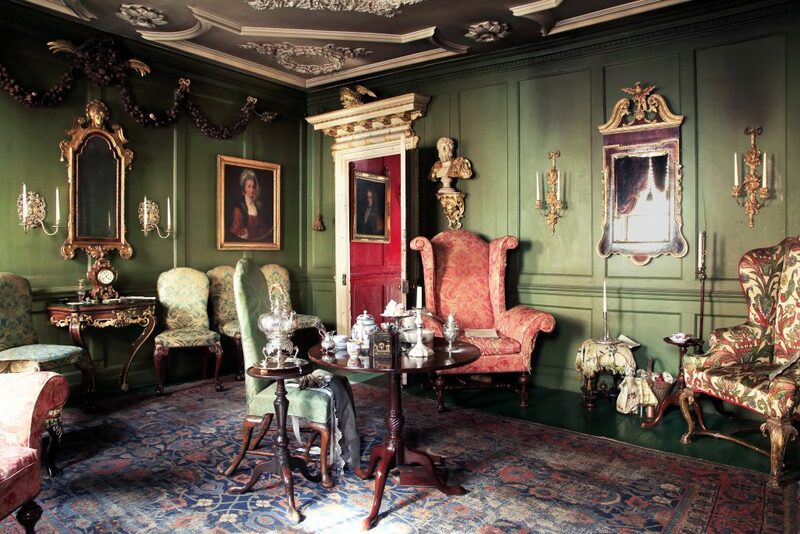 For more information please visit the Dennis Severs’ House website.